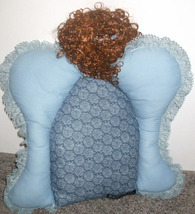 These Angelpillows were designed and copyrighted by me. NO reproduction is allowed please. I have made these for every occasion you can think of, weddings, funerals, graduation, Valentine's Day, Christmas, Mother's Day, etc. They come in two sizes large which measures app. 16 by 15 and small 9 by 8. I can custom colors of face, body, hair, hands, et. with color of your choice. Must allow sufficient time for large orders. I will also combine shipping if you order ore than one and can work with you on bulk orders as well on price of Angelpillows and shipping. 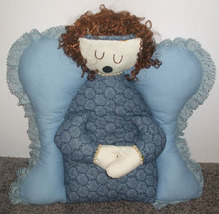 Remember I can custom make one just like this even though this one is sold.